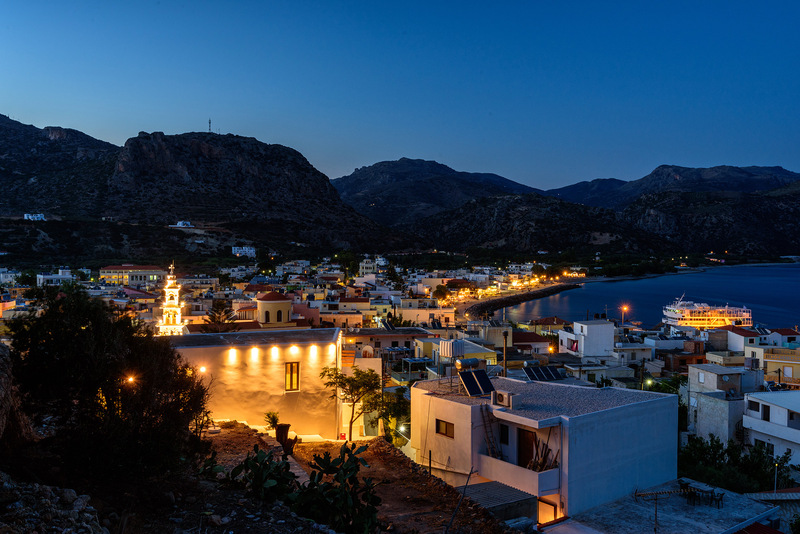 This village on the less-developed southwestern coast of Crete is about 40 km southwest of Chania in a straight line, which is more like 70 km if you follow the roads as they twist and turn through the White Mountains. This scenic village of about 2,000 is built on the base of a small peninsula jutting a kilometer southwest into the Libyan Sea. The inlet at the end of the peninsula has been reconfigured into a nice little harbor where local fishermen dock their boats and where a few excursion boats which ply the southern coast come and go. This self-named "Bride of the Libyan Sea" is indeed a beautiful spot. It offers beaches both on the east and the west sides of the peninsula; the sand is on the west, and the pebbles are on the east. In addition to plenty of rooms for rent, Paleochora also has a couple campgrounds; one at the east end of Halakia (Pebble) Beach, and another at Grammeno, 4 km west. 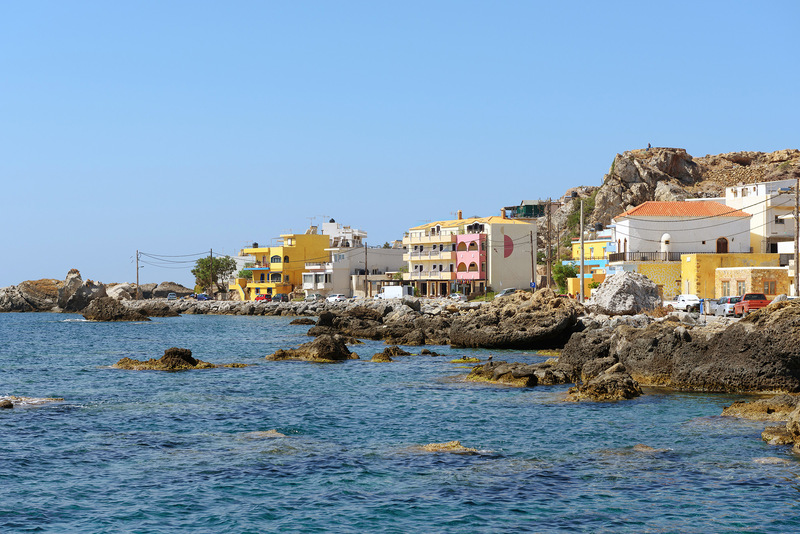 There's plenty to do in Paleochora, including windsurfing, fishing, scuba diving, and hiking in addition to the traditional sun bathing and swimming in the clear waters of the Libyan Sea. There's a bit of nightlife, too, but it's definitely more low-key than a lot of places on the north coast. Short cruises into the Libyan Sea are available, where you can see dolphins and Mediterranean whales. 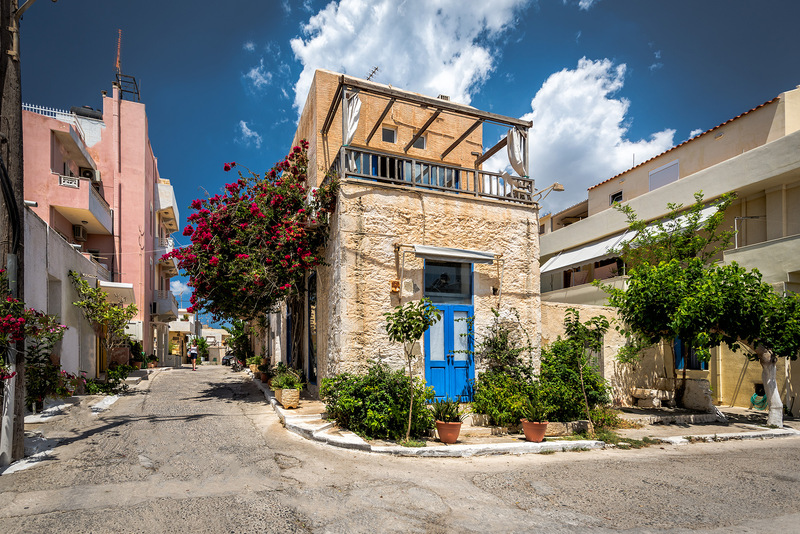 The village itself is a work of art, with traditional whitewashed houses decorated by the ever present climbing bougainvillea and oleander. There is a nice, tree-lined promenade along the west side of the peninsula, lit up at night by old-style cast-iron street lamps. Hippies in the early 70's first put Paleochora on the map. A number of them sold hand-crafted items on the streets, and some bought houses and stayed, lending a bit of a cosmopolitan atmosphere to the village. 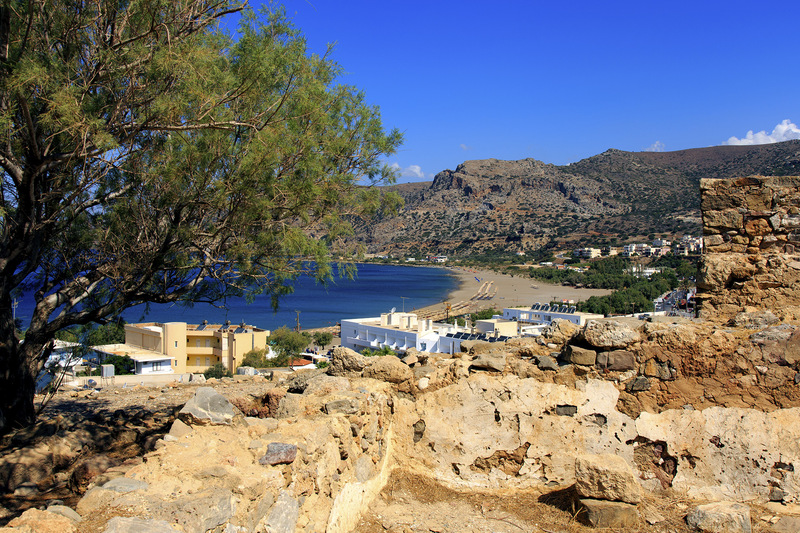 The ancient settlement of Kalamydi was originally on the site of Paleochora. Just south of the village and on the peninsula are the ruins of the Venetian fort of Selino Kastelli, also called Fortezza, built in 1282. The fort was destroyed by the Turks in 1539,and then rebuilt. The Turks took the town in 1645, but 200 years later Robert Pashley, a traveler from England, wrote that Paleochora was uninhabited and the fort was in ruins. People began moving back in 1866. A rear-guard action was fought in Paleochora between a motorcycle-riding German reconnaissance battalion and Greek and Cretan troops. During the 1950's a number of inhabitants of the large but isolated island of Gavdos, 50 km southeast of Paleochora, traded their land there for building lots in Paleochora through a program sponsored by the Greek government. The neighborhood they built is known as "Gavdiotika." Paleochora is home to the Akrites Museum. The Byzantines named these watchmen of the borders ("akres" in Greek) of the Byzantine Empire "Akrites." A better English word for them might be "frontiersmen." They were appointed by the Emperor as a sort of first line of defense against Arab incursions onto Byzantine territory during the Byzantine-Arab conflicts in the 7th-11th centuries. For their labors the Akrites were rewarded with landholdings. Their greatest hero is Digenis Akritas, about whom 7 manuscripts have been found detailing his military exploits. The narrative structure of these manuscripts is similar to the much shorter Akritic Songs, which talk about the bravery of the guardians of the Empire's eastern borders. There is a similarity between these frontiersmen and the work of the Rangers in JRR Tolkien's The Lord of the Rings. Tolkien's Rangers were the remnants of a kingly race assigned to guard the borders of Middle Earth from attack. They were, like the Akrites, imbued with a certain air of romance and nobility. 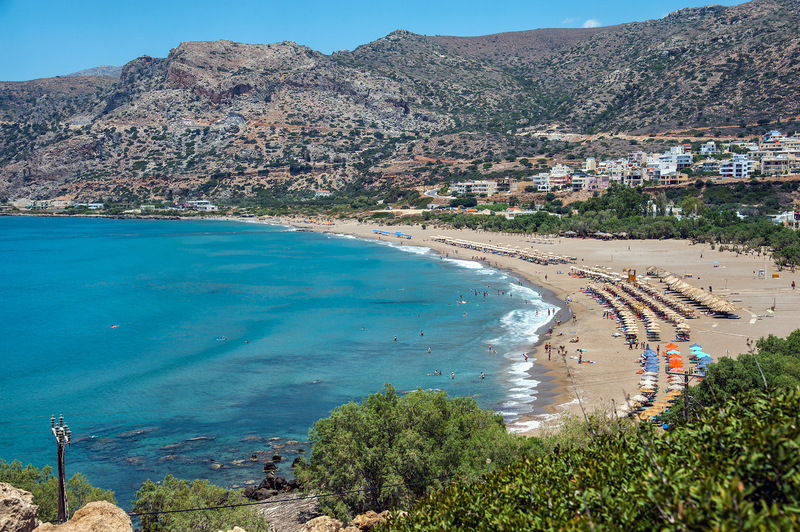 Paleochora is a semi-remote, beautiful, interesting place rich in history, not to mention a great place to just relax on the beach and enjoy the wonderful climate of southern Crete.